September | 2014 | Is it good enough yet? Should you take the Rapid Software Testing course? 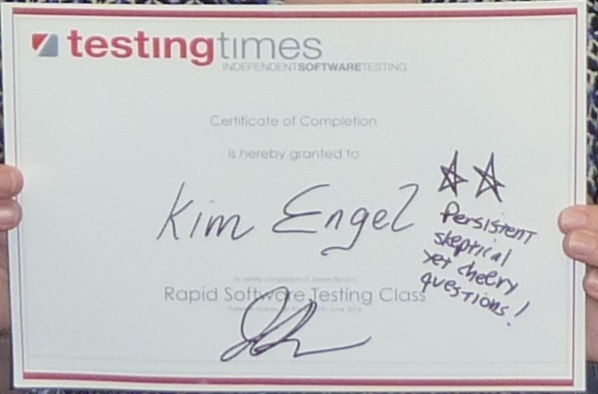 This year I flew to Australia from New Zealand to attend the Rapid Software Testing course with James Bach, hosted by Testing Times. The course is crammed with practical tips that you can start using immediately on your current projects. James has concocted mnemonic devices that really work. Practical exercises are a great way to practice and demonstrate what you’ve just learned, and being in the ‘hot seat’ is a challenging and memorable experience. Once James dons his cap the teacher has gone, and the pointy-haired boss has arrived. I highly recommend volunteering for a hot-seat challenge, to help get the most out of your experience. I’d already done some of the RST practical exercises during a Skype coaching session with James, so I sat out the first exercise… for about 30 seconds. Then I realised* I could pick up where I’d left off with the exercise, taking my learning to the next level. I found my old Skype chat transcripts, pulled up my previous test findings, and continued digging deeper into the exercise. I was even able to channel Rich and ‘Go Meta‘ which I was very excited about. During the course I also learned transferable skills from James’ tips, mentioned as asides on coaching, critical thinking, presenting, professionalism, accountability, responsibility… There is such a wealth of information packed into this course! I was completely engaged throughout the entire 3 day course, and in that sense it was exhausting. As a participant I felt like a contestant on QI – if you answer questions with the first thought that springs to mind, expect to hear the Klaxon. Only instead of a klaxon, you’ll be treated to an extensive set of follow-up questions until you realise how shallow your initial answer was, and relish the opportunity to provide a more thought-out response. On the second night I arranged dinner with some of the attendees and we talked testing over wine. Then in a fancy Sydney restaurant we started playing the dice game. I love the tenacity I saw from my fellow testers that night. 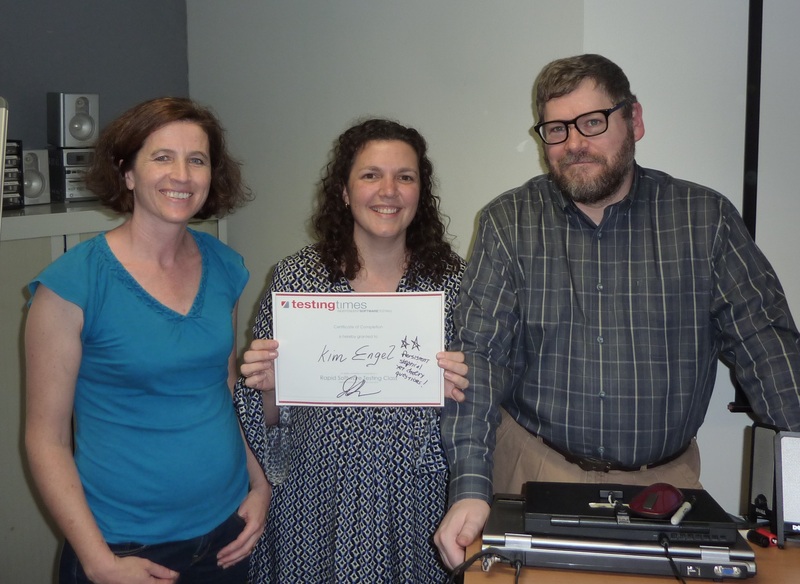 I also met some intelligent and enthusiastic testers, had fun, learned a lot, and filled my writing pad with notes which I regularly refer to. I’m thrilled that I decided to invest in my own education and make the trip back to Sydney. *I remembered reading another RST grad’s blog where they did exactly this about 10 minutes into an exercise. With the benefit of their experience, I only wasted 30 seconds. Thank you blogger-whose-post-I-can-no-longer-find! I recommend reading other’s blog posts on their RST experiences when deciding whether to go, and in preparation for attending. Such as the one you’re reading now, and some of these. Martial Tester has a great list of posts.